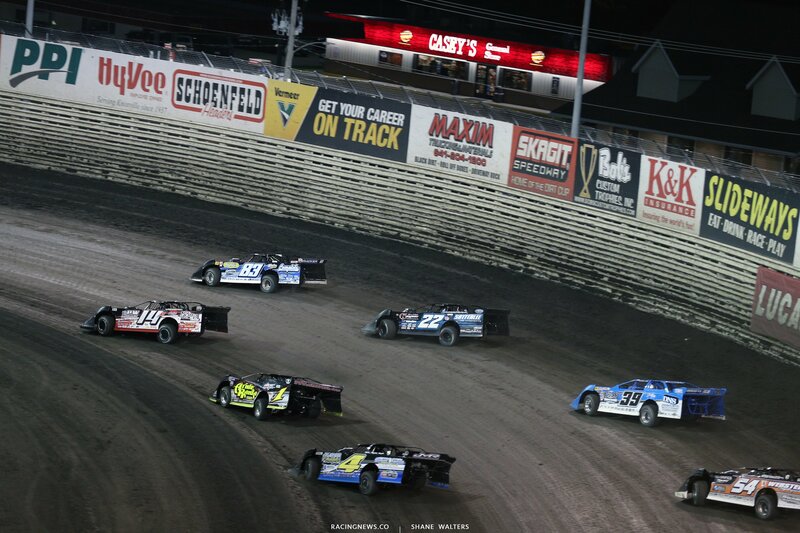 View full 2018 Lucas Oil Knoxville Late Model Nationals race results below. Scott James and Gregg Satterlee set the front row for the C Main. The top 4 will transfer to the B Main. Green flag, James noses ahead on the bottom into turn one. Satterlee hits the cushion. Satterlee has momentum off turn two. James leaves the lane open and Satterlee drives by on the outside down the backstretch. Lap 3, Satterlee heads to the bottom. He’s exploring the bottom for the first time. James is on the gas around the top. 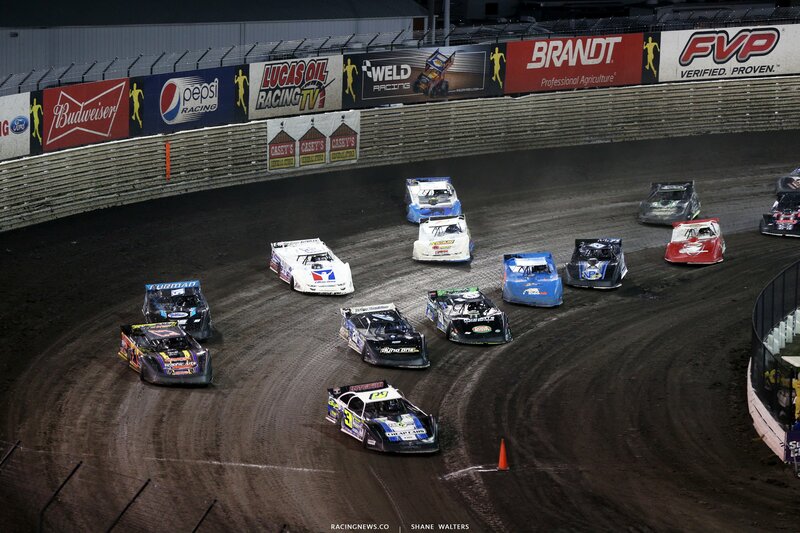 Same thing in reverse, James powers to the lead on the outside as they head into turn three. Lap 11, slow car down the back. The caution is out. Green, Morgan Bagley is looking for the lead on the bottom. He noses ahead. James fights back. They run side by side. Still side by side. Coming to 1 to go, James has him but two feet at the line. Bagley runs the bottom. He drives it deep into turn three but he can’t hold the power down on the exit. Scott James takes the win in the C Main of the Late Model Nationals! Jeremiah Hurst and Brian Shirley will lead them to the green in the B Main. The top 6 will transfer to the tail of the Main Event. Green flag, Hurst leads on the bottom into turn one and off turn two. Lap 2, Shirley has a run on the outside he takes the lead. Hurst takes it back. Shirley moves to the bottom and slots in behind Hurst. Landers is coming in a hurry. As the leaders run the bottom. He’s clicking around the top. Landers to the bottom, he can’t hold it down there and pushes up the hill. Hurst is also out of shape. Thornton Jr takes over 2nd. Lap 12, Brent Larson is slow on track. The caution is out. Green, Shirley leads. Rettig jumps the cushion he tags the wall. The caution is back out. Green, Shirley leads Thornton into turn one. James is coming! James started at the tail of the field, he’s one position away from a transfer spot. Lap 15, Thornton looks to the inside of Shirley into turn one. He takes the lead! Thornton started 13th. Caution, slow car on track. Green, Thornton leads on the bottom. He’s driving away. Ricky Thornton Jr wins the B Main! Brandon Sheppard and Earl Pearson Jr trail the pace truck ahead of tonight’s main event. They form the four wide salute for the Iowa dirt racing fans. They’re ready for the 100 lap dirt late model main event. The race winner will hit the road with a check for $40,000. Green flag, Sheppard leads by a car length into turn one. Pearson Jr is on the cushion. Pearson is looking outside. He’s there. They run side by side back in turn one. Pearson leads off turn two. Pearson opened up a several car length gap. That’s now gone. Sheppard is on his back bumper. Sheppard retakes the lead on the bottom. 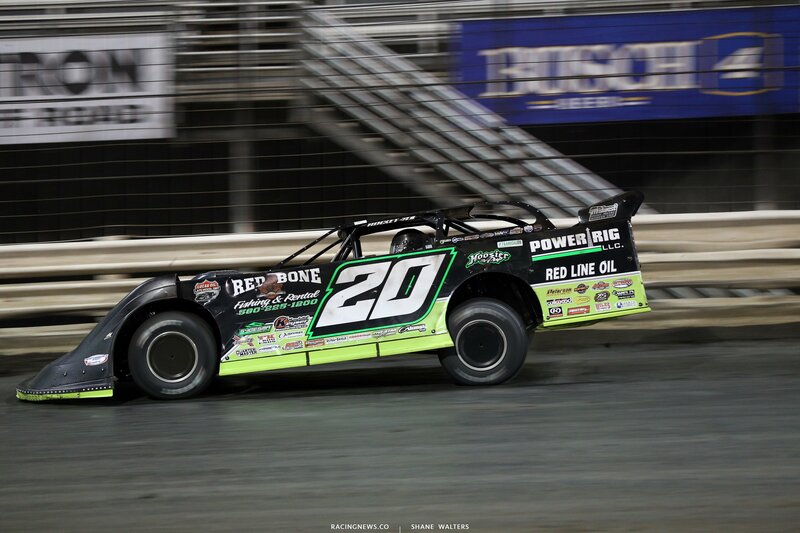 Bloomquist is coasting into turn one. It’s a long race. He’s being super easy on the tires early. Pierce is flying through the field. He started 22nd but he’s about to crack the top 10. Green, Sheppard leads. Bloomquist takes 2nd. Lap 20, Sheppard and Bloomquist both run the middle of the race track. They’re driving away from the field. Lap 22, the caution is out. Mason Zeigler is in the wall. This will be the fuel stop as well. Green, Sheppard leads Bloomquist Jimmy Owens to 3rd. Lap 35, the leaders are in heavy lap traffic. Owens has caught Bloomquist. Pearson has caught Owens. Three cars run nose to tail for 2nd. Lap 38, Chris Simpson is stopped on the track. The caution is back out. Moyer, Heckenast Jr, Zeigler and more head for the pit area. Green, Owens to 2nd. He’s looking for the lead. Owens has a run off turn four. He crosses him and Owens looks to the bottom in turn one. Owens is clear, new leader. Lap 41, Landers is in the wall on the front stretch. The red flag is out. Landers is ok.
Green, Don O’Neal to 2nd. Pierce to 3rd. Sheppard falls to 4th. Pierce is all over the back bumper of O’Neal. 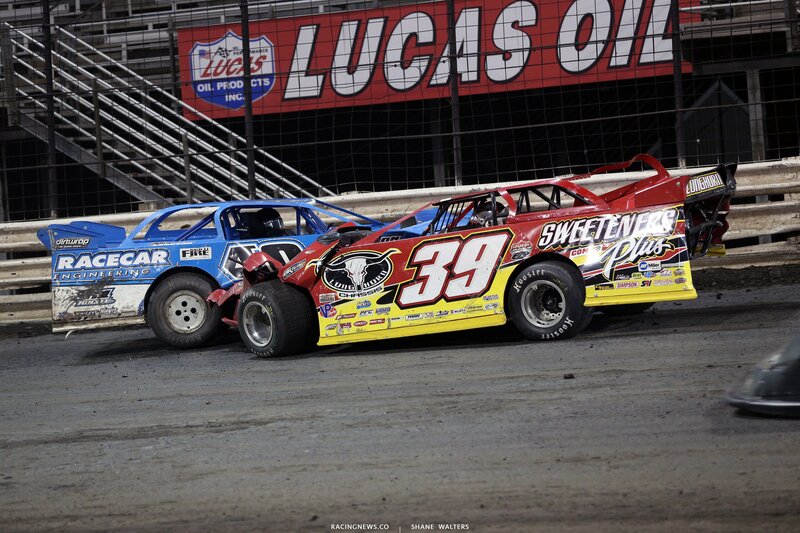 Both cars bounce off the cushion. Lap 47, Tyler Bruening is slow on the track The caution is back out. Green, Pierce slides O’Neal for 2nd into turn one. 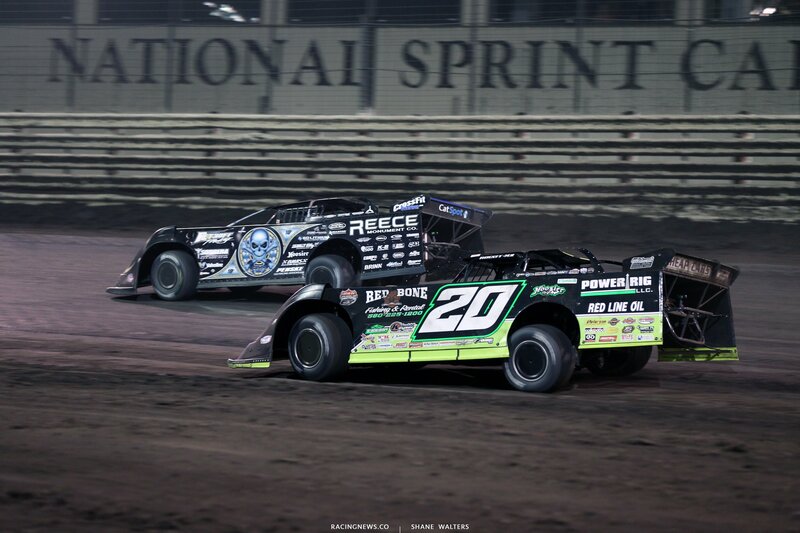 Bloomquist is working on him but can’t complete the pass. Bobby Pierce has caught Jimmy Owens. The cushion is right against the wall at the entry to turn one. Both leaders run that lane regardless. Lap 51, Jimmy Mars is slow on track. He caution flag drops once more. Green, O’Neal slides Pierce into turn one. Pierce was already on the gas. O’Neal comes across his nose and Pierce gets into the back of him. Lap 54, big crash in turn two. Satterlee got into the wall. McCreadie and Bronson tangled as they came into the scene. All 3 cars got collected, The red flag is out but all drivers are alright. 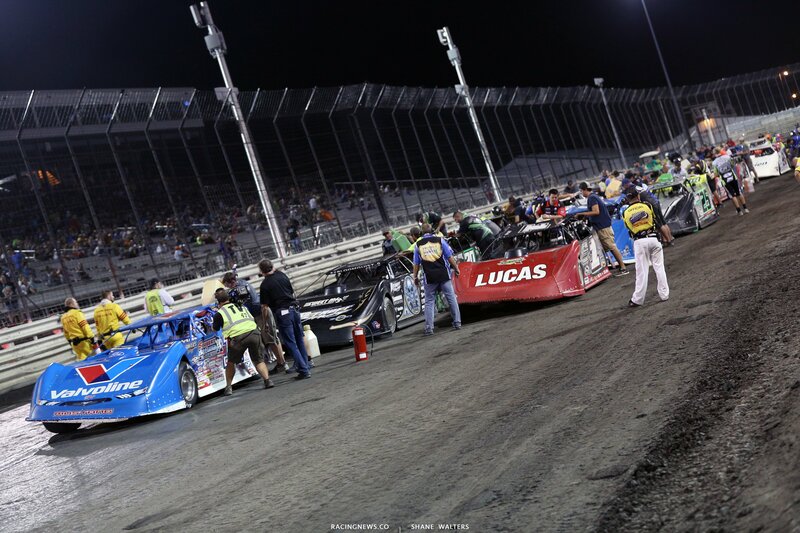 Green, Owens leads O’Neal and Pierce into turn one. Sheppard moves back into 4th as he picks up cars on the bottom. Lap 56, Clanton is in the wall. The caution is out. Green, Bloomquist moves to the middle and makes it 3 wide at the flagstand for 3rd. He takes the spot. 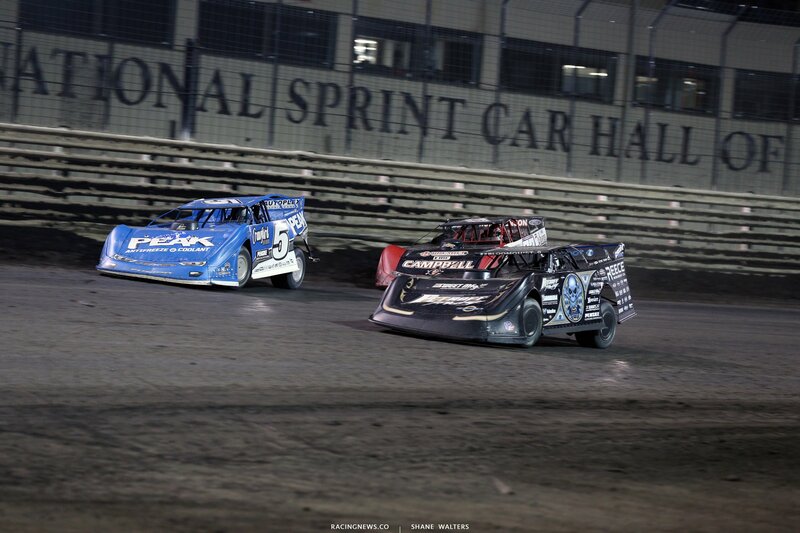 Bloomquist looks low on O’Neal for 2nd. He’s clear on the bottom. O’Neal, Pierce and Sheppard run nose to tail for 3rd. Pierce takes the position. Pierce bounces off the cushion as the car launch airborne in turn two. Pierce gathers it up and holds the position. Lap 70, Pierce has caught Bloomquist. He looks to the outside in turn one. Pierce wins the race off turn two. Owens leads by a full straight away. Lap 75, Owens is deep in lap traffic. Pierce has caught the leader. He’s on his bumper. Pierce jumps the cushion in turn two, he loses three car lengths. Lap 80, Pierce is back on his bumper. He slides him in turn one. Pierce leads, he jumps the cushion off turn two! The car bounces violently as Owens drives back by on the bottom. Pierce gathered it back up. 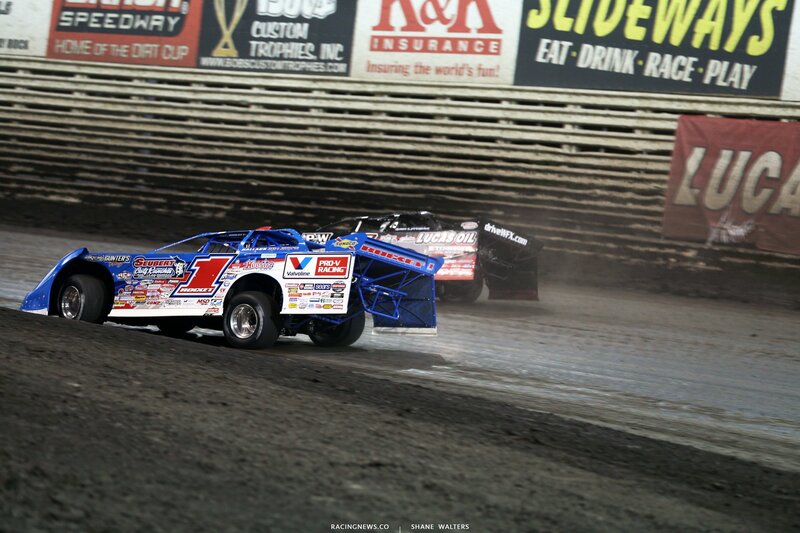 Brandon Sheppard has a flat. The caution is back out. Green, Pierce falls to 4th. He drives under Richards to get one of those spots back. Lap 88, Pierce is slow on the track. The caution is out again. Green, Owens leads. Richards is on the back bumper of O’Neal for 2nd. Owens is driving away. 5 to go, Pierce is flying through the field. He’s up to 7th. Owens is driving away! 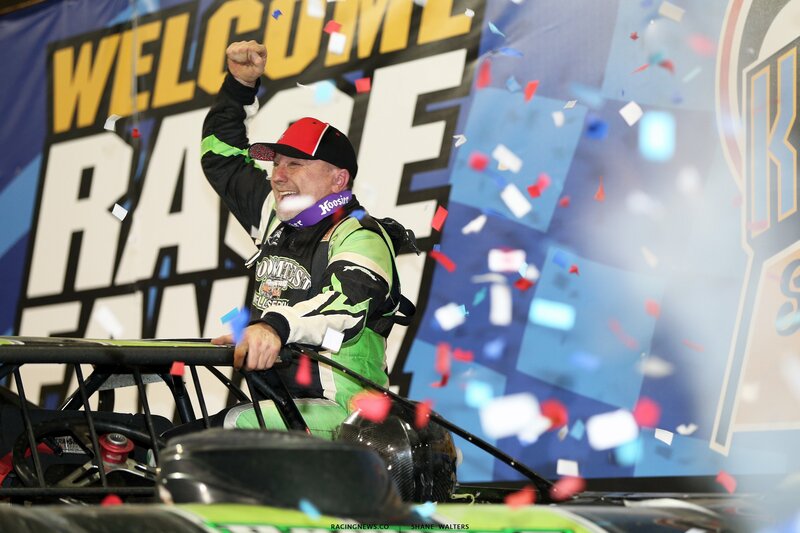 He takes the win in the 2018 Late Model Nationals at Knoxville Raceway! 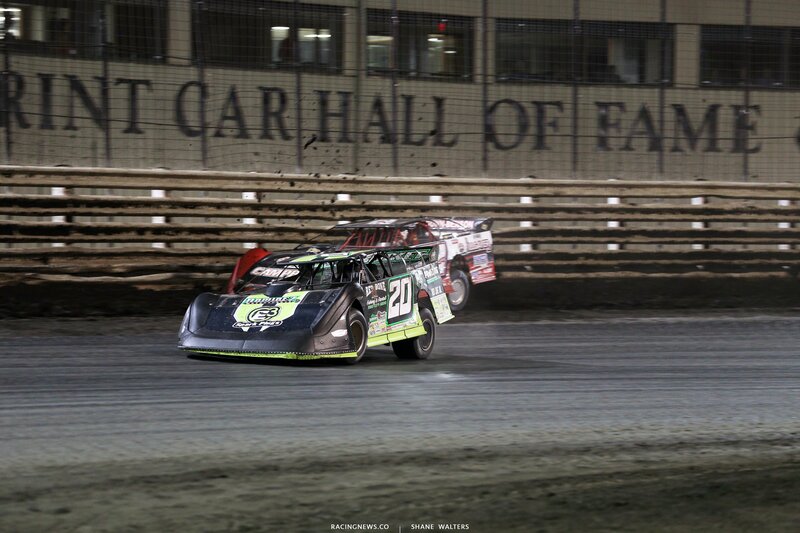 View full 2018 Lucas Oil Late Model Nationals race results below.